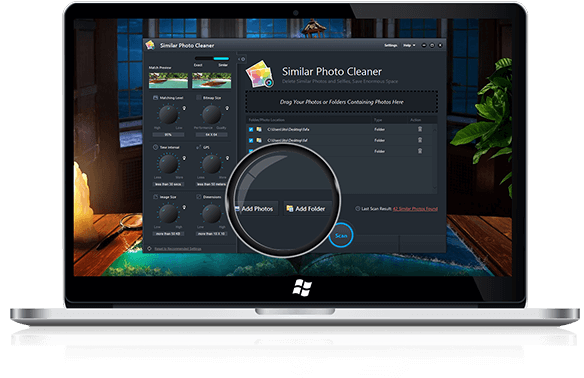 With Similar Photo Cleaner’s features, you can now quickly search identical looking images and selfies irrespective of filename and file content, and delete them. Lets you drag and drop photos and folders containing your photos. Lets you scan and remove similar photos from external devices like pendrive, external hard disk etc. Deletes multiple copies of similar photos with a single click to give you an organized gallery. A good amount of disk space is released keeping your system and gallery optimized. How Does Similar Photo Cleaner Work? Add your photos or a folder containing your photos to the scanning list. You can even drag and drop photos or folders containing photos. Now set matching parameters by increasing or decreasing the knobs to improve accuracy level of the search according to you. Click ‘Scan’ button to start searching for similar photos and selfies from your added collection. Watch Similar Photo Cleaner do its job perfectly. 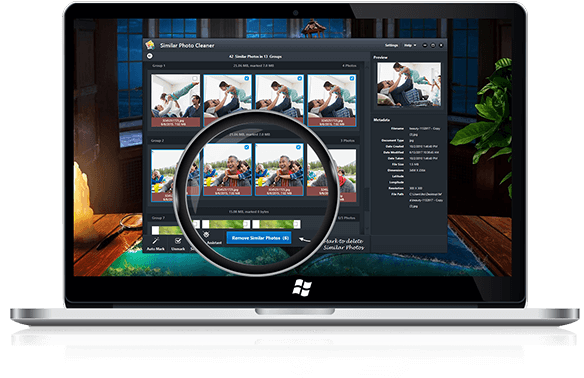 Once the scan is complete, you can then review your photos and delete multiple versions of similar photos and selfies with a single click, thereby freeing up precious disk space. 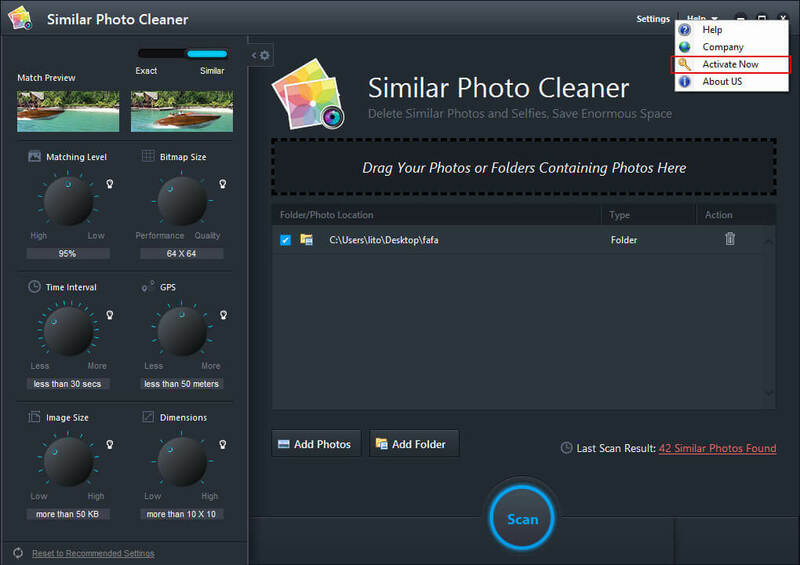 Similar Photo Cleaner is an easy and efficient similar photos removing tool. It scans similar photos irrespective of filename and file content. It is a utility tool that organizes your digital gallery for viewing and sharing. In the process of organizing and removing duplicates and similar photos, it frees lots of disk space which helps in optimizing the system. 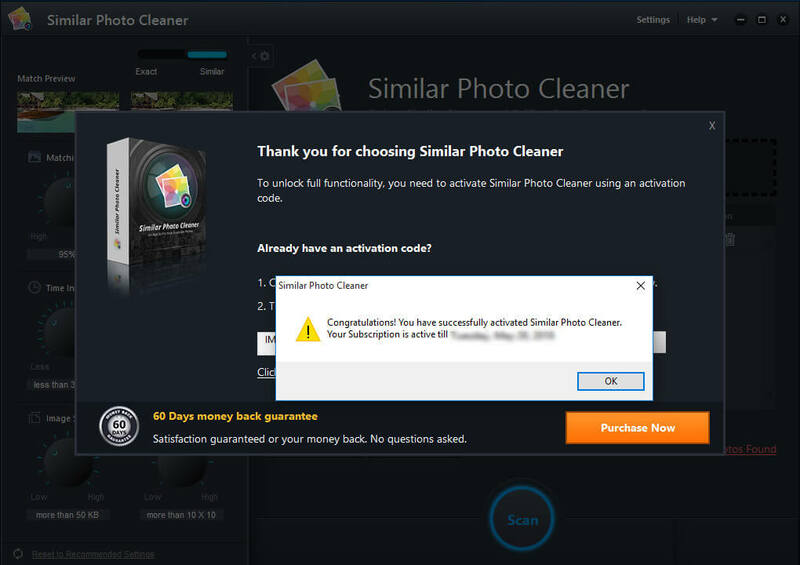 What are the system requirements for Similar Photo Cleaner? I am unable to delete all Similar Photos at once. Why does my system need Similar Photo Cleaner? In today’s world everyone is a photographer while smartphones have replaced cameras and Albums turned into photo gallery. A tool like Similar Photo Cleaner helps in organizing the photo gallery by sorting and cleaning the similar photos with ease and accuracy. 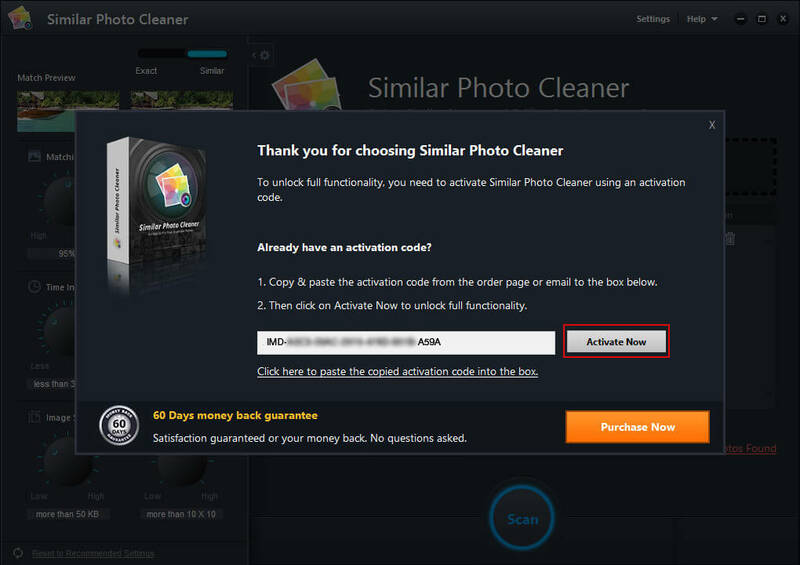 How to activate Similar Photo Cleaner? Step 1: Launch Similar Photo Cleaner. Step 2: Go to Help > Activate Now on the top right of the application screen. Step 3: On the next screen that appears, click on ‘Click here to paste the copied activation code into the box’ below the text box or manually paste your key in the box by holding keys ‘Ctrl’ and ‘V’ together. Step 4: Click on ‘Activate Now’ button. Step 5: Similar Photo Cleaner will be activated. You can always mail us at similarphotocleaner@support-geeks.com . You can even create a support ticket for any feedback or assistance. I have a huge collection of photos on my computer in which many of them are similar. I could never get time to organize them by deleting the similar ones. I am so much thankful to Similar Photo Cleaner that all my photos are now organized. When your PC is loaded with thousands of similar photos and you want to reclaim storage space for some other stuff, searching for the similar photos could be very time-consuming. Similar Photo Cleaner does this in seconds. Thanks! As I am a photographer, my computer is filled with many similar looking photos. I need to clear my PC’s storage from time to time to recover space and organize my collection. Now, I don’t have to waste my time doing this. All thanks to Similar Photo Cleaner!